The Skeleton Coast shoreline is dotted with bleached whalebones and other skeletal remains, as well as a host of shipwrecks. 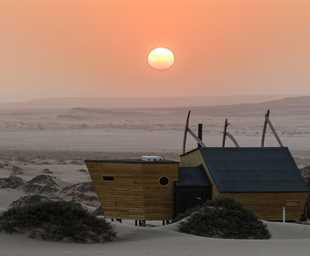 It is a wild, desolate environment, yet it supports a host of incredible adapted wildlife. The arid conditions do not support large volumes of big game species, but offer an exploration of the smaller desert wonders. Freshwater springs permeate through the barren sands to create rare oases in the desert that sustain pockets of wildlife. Springbok, gemsbok (oryx), the rare desert-adapted elephant, brown hyaena, black-backed jackal, and occasionally even lion and cheetah enter this rugged domain. The famous Cape fur seals are present in their thousands on the beaches, attracting predators as well. Birding in the area is also very good, with over 200 species recorded. 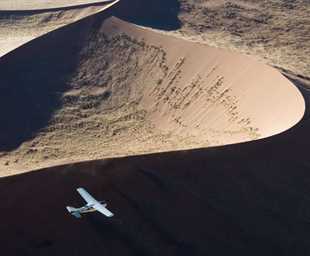 This includes several of Namibia's desert endemic species - such as Tractrac Chat, Rüppell's Korhaan and Gray's Lark. The seal colonies often have Jeagers and Skuas in attendance with Parasitic Jaeger, Pomarine Jaeger and Subantarctic Skua all possible in summer. 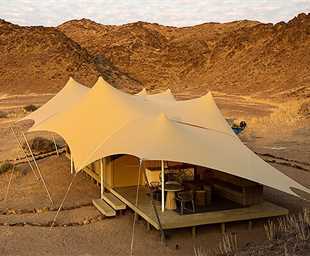 Hoanib Skeleton Coast Camp is scenically located in a broad valley at the confluence of two tributaries of the dry Hoanib River in the northern part of the private Palmwag Concession.